The farm started with 40 ares of land in 1972. The next year, one “Kohaku” and one ” Taisho Sanshoku” spawned. 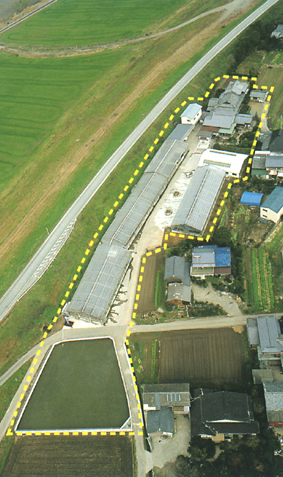 We have exerted ourselves to expand the farming area, and increase production and qualities. The number of farming areas is now eight green houses, five mud ponds over 1 hectare, three mud ponds over 3 hectares and mud pond for fry. There are fifteen staffs in Ogata koi farm today. “Benimaiko” of the 21st Show. We have been providing beautiful traditional Japanese Nishikigoi to the world. general. Since 1985, the amount of exported koi has been increasing. Our farm is offering meeting strongly international in character every year. Career: Set his heart on studying Nishikigoi while in high school. 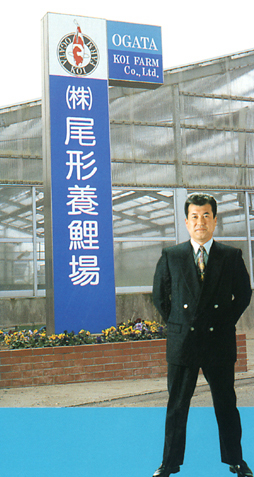 “God of Nishikigoi”, the owner of Izumiya koi farm in Ojiya city. We make a studious effort to breed OGATA KOI and ship them all over the world.